Every once in awhile you will hear about people who they themselves or their friends have spotted or met their doppelgänger. While Sir Walter Bodmer, Professor of Human Genetics at University of Oxford, claims that “the overall chance of finding someone who looks exactly like you is really very small” it seems to have happened once again for someone. On Thursday evening, photographer Neil Thomas Douglas boarded his flight from Glasgow to Galway where he was going to be shooting a wedding. When he arrived at his seat though, someone was already in it so he politely asked the man to move. When the man looked up, Douglas realized the man looked exactly like him, or at least very similar. They both had bushy beards, ginger hair, and were even wearing similar coloured shirts. 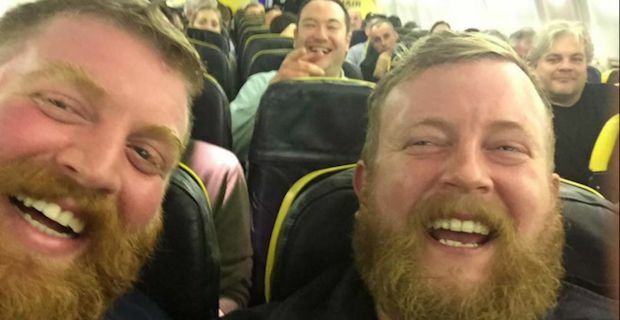 Mr. Douglas said, "When I got on the Ryanair flight, there was a dude already on my seat - when the guy looked up, I thought: 'He looks like me'. We had a big laugh about it - everyone around us had a laugh, we took a selfie and that was it." But the story doesn’t end there. When Mr. Douglas was checking into his hotel, he realized his London based ‘twin’ was checking in ahead of him. And then when he went to a pub, his doppelgänger was there as well. A very spooky start to this Halloween weekend indeed.